This Japanese inspired breaded chicken cutlets are like an Asian version of Italian Chicken Milanese. 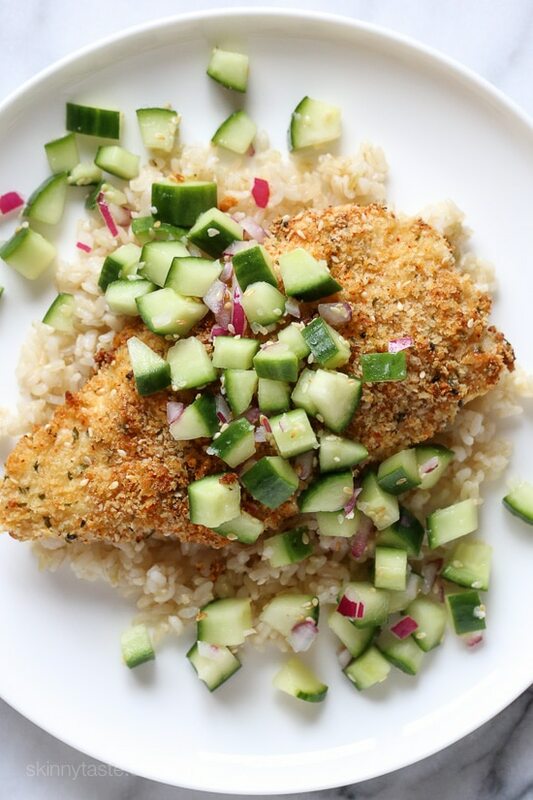 The Japanese Togarashi spice blend is combined with panko for a spicy, crisp coating, and topped with a fresh, light sesame cucumber relish that gives this dish so much flavor. You can find the Togarashi Spice Blend in any Asian store or here on Amazon. 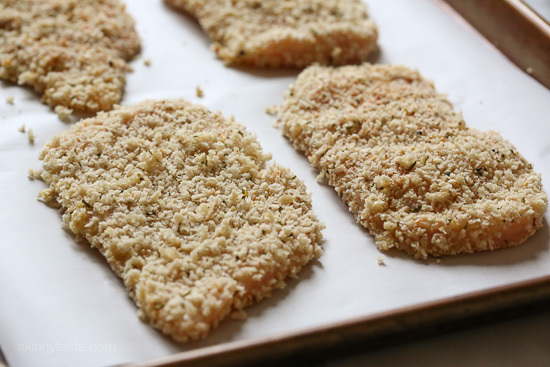 These Japanese inspired breaded chicken cutlets are like an Asian version of Italian Chicken Milanese. The Japanese Togarashi spice blend is combined with panko for a spicy, crisp coating. In a small bowl, whisk together vinegar, sugar, sesame oil, ginger, garlic, and salt. 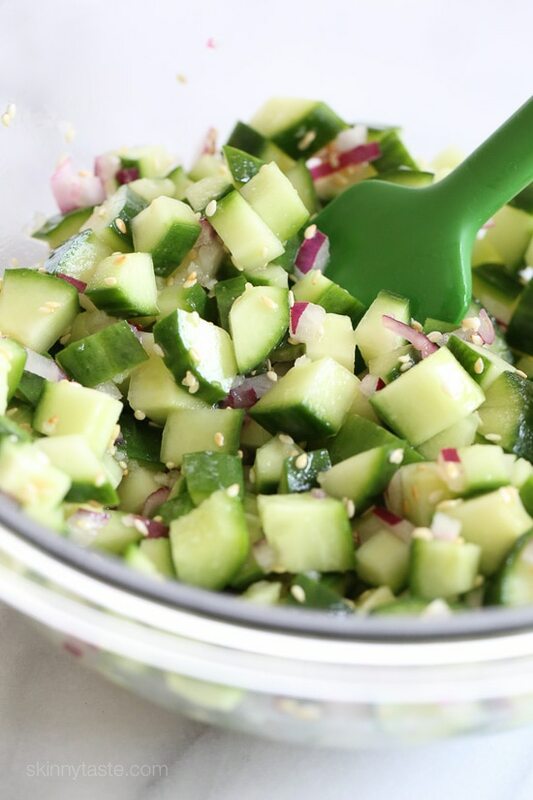 Add cucumber, onion and sesame seeds and stir. Set aside to allow flavors to combine. Season chicken cutlets with ¼ teaspoon salt and pepper. Place flour on a shallow plate and egg in a medium bowl. Place panko, Togarashi, ¼ teaspoon salt, pepper and sesame seeds on another shallow plate. Dredge each cutlet lightly in flour, then egg (shaking off excess), then panko mixture. Place on a sheet pan covered in parchment. 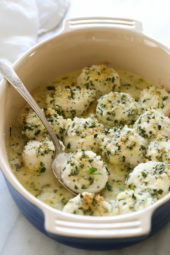 Spray cutlets lightly with olive oil and bake for 20 minutes, rotating pan halfway through. Top each cutlet with about 1/2 cup relish, 1 teaspoon soy sauce and sriracha (if desired). Serve. Loved this recipe! Served it with some Miso Soup and sautéed broccoli slaw (using the extra garlic and ginger). I am wimpy when it comes to spicy, and this was just on the edge for me, but it was great. My family thought it was fine. Hi! What would you suggest as a side for this? 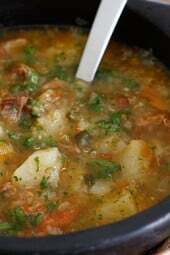 It looks like in the picture there’s some rice underneath it-any particular type that you think goes well? Delicious! A family favorite. I would add a little bit more of the Japanese spice next time because we like spice. What a nice change up! My family loved this! I think next time I might do either double the sauce for the cucumber/onion relish to drizzle over the chicken, or make a sauce from mayo/rice vineagar/sriracha/sugar. While the flavors were incredible, my mouth craved a little bit more liquid for the chicken and rice. Will definitely make again! Could you do this in the air fryer if so what would the cooking instructions be? I just got one for Christmas and trying to use it when I can! Made this tonight and it was a hit. I did use regular Panko breadcrumbs but looked it up and they are the same points value as the whole wheat. I will us more of the pepper blend next time. Also cooked in an airfrier for 11 minutes. It was so easy and fast, crispy too! Yum! I did post a picture on connect. I have pulled a weeks worth of meals to try. Love your blog and appreciate your hard work. 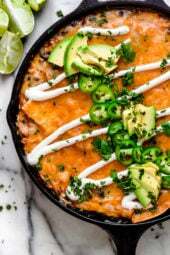 Keep these delicious recipes coming. What temp did you set on the air fryer? Can you tell me how many portions this recipe is for? In all my years following you this is one of my FAVORITE recipes from you. What is the smart points for just the chicken cutlet. We made this last night and it was SOOOOO GOOD! The Japanese 7 Spice really gave a nice little kick and the cucumber relish gave the perfect crunch. This is definitely going into the rotation! YUM! We made this and it is to die for! One of the best things I have had in a long long long time. My husband is in love with it and he does not like cucumber. We also made togaroshi edamame as a side. My daughter loved it! Loved this! We actually already had togarashi in the pantry from another recipe so I was so happy for another excuse to use it. And the cucumber relish is delicious! Will definitely make this again. Amazing! Just like others have said, don’t leave out the spice, I ordered mine on Amazon, got it in 2 days, worth waiting for. Also do not leave out the soy sauce, it did a wonderful job tighting all the flavors together! I even put a little bit extra! This was well worth the hunt for the 7 spice powder. One suggestion though, it’s a little unclear what you’re supposed to do with the egg–why is that in a bowl and the other two things are in a shallow pan? Dip in flour, then egg, then crumbs. This was amazing! I left out the sugar in the relish and it was still delicious. Also I pan fried the chicken in about 1-2 tablespoons of olive oil instead of baking. It came out super crispy and delicious. I’ll plan to make this many more times. Can I use other vegetable beside cucumber? It does not like me and I don’t care for it. My husband hates cucumber so I usually use zucchini. I am going to try this tonight! Found the spice blend at Stop N Shop in the gourmet spices aisle. Any suggestions for sides to go with this? Can the cucumber relish be made the day before and fridged overnight so the flavors combine? I chopped the cucumber and onion 2 days before (during Sunday meal prep), and stored in pyrex until Tuesday night and it was just fine. Mixing the whole relish would probably work fine a night before too! I use leftovers the next day so yes it’s fine! I made this with a boneless thigh – YUM! I loved the sriracha/soy combo. Delish!! I want to make this. I don’t have any of the spice blend at home. Is there a sub I could use? I couldn’t find it. I’m toasting sesame seeds and adding ground ginger, cayenne and red pepper flakes. Putting in the mortal and pestal. Hopefully it’s close. I’ll post my results. It tastes like toasted sesame with a kick but overall okay. Might marinate in light citrus next time to make up for orange peel in spice. There are no directions for Crispy Togarashi Chicken with Sesame Cucumber Relish. This dish lokks amazing. Can you please send them to me? Thank you so very much… I will be making this tonight!